Our hall lets its guests celebrate in the festive country house ambience and stylish atmosphere. Here you can enjoy the culinary specialties overlooking the garden. In sunshine and nice weather you can use the direct access to the garden. 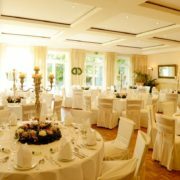 Approximately 100 people can be accommodated in our ballroom, in conjunction with garden rooms even up to 150 people. This room is the actual restaurant for the a la carte guest, in which one gets the culinary treats of our kitchen served with cultivated table culture. 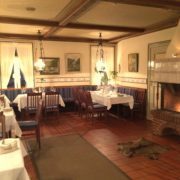 In the Nordic Frisian style you can experience the elegant cosiness of the fireplace. The fireplace room welcomes guests with warm colors in a Mediterranean country house style. Here you feel surrounded by sun and light and can leave everyday life behind. 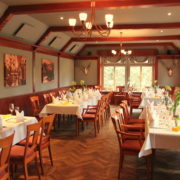 This room is used both as a breakfast room, as well as a function room for celebrations with up to 50 people. The guest room with integrated counter is also in the Nordic Frisian style for cozy evenings. 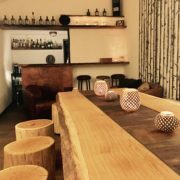 Here you can dine and drink in a relaxed atmosphere at the table or counter. The garden room is the ideal space for small family gatherings and meetings that want to meet in a comfortable atmosphere. This offers 10-30 persons Patz and has direct access to the garden. 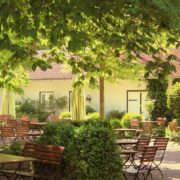 Celebrate like private, in a room that is just like home, with its own bar and all this with direct access to the idyllic Hofgarten. You have the choice between all-round service or self-sufficiency. The bottle chamber can be used for various purposes, such as barbecues with use of the court garden, birthdays, meetings and much more. 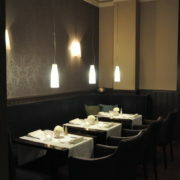 The table can accommodate up to 16 people, in a “stand-up party” you can enjoy the ambience up to 30 people. To relax and unwind without having to miss culinary delights, invites our idyllic courtyard garden in the countryside. There you can be pampered in peace and forget everyday stress. 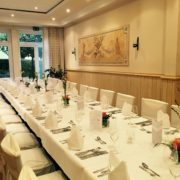 Over 100 years old chestnut trees and many beautiful plants provide a romantic – festive setting for special parties and receptions.